Hoof beats thundered all around. Kate glanced through her mud spattered veil over a shoulder. Four… no, six riders in close pursuit. Their mounts look tired. A large man on a superb chestnut stallion rode to her side. I recognise him and his horse from last year. I think they won. He’ll soon be making a move. Ahead were five racers, throwing up clumps of dirt, the surface of the road compromised by overnight torrents of rain. Everything is going as planned. I’m in good position. There’s that lane on the right. Almost time to leave the road! The previous day Kate had scouted the route several times and decided upon a bold tactic. By cutting from the pack early and galloping across a pasture no one else ever thought to enter, she would be taking a straighter path to Bicknoller and save precious seconds. It meant an extra jump through a thick hedgerow… but Kate had discovered an opening. She had slyly stayed with the pack on the way to Crowcombe, as to not reveal the shortcut, keeping it a secret for the return half of the race. “All right, Misty?” Kate needlessly whispered to her hunter. The dapple-grey mare fast cantered, ready to gallop whenever the signal might come from her mistress. Kate rocked her hips in the saddle, keeping her hands steady, legs squeezed, and heels low. Now! Kate alerted Misty slightly with her right hand, tapped once with her right heel, then applied pressure with both heels and gathered the reins. The mare raised her head, turned, then leapt over the blackberry brambles into the unknown beyond. Kate let the reins go long for a moment as they landed in the soft turf, then gathered them again. “Ha, ha!” Kate felt elated and Misty sprang into a gallop. Did anyone follow us? No… we’re alone. They raced across a muddy pasture to the hedgerow and plunged through, clearing the stone wall. Kate looked left, reining back to a canter, and watched the bobbing heads of horses and upper halves of men cantering upon the road. Some would undoubtedly remain on the road to Bicknoller, their mounts too weary for more jumps, but others would soon be in her pursuit. She watched as seconds later men started jumping the brambles and entering the field. A few yelled out exclamations of awe or surprise upon spying Kate in their lead. Kate didn’t look back but smiled, knowing it must be Hugh Wansbrough cheering her on. All the participants would surely gallop across the broad field upon which they now raced. The pack reformed well off to Kate’s left, heading for the most challenging of jumps; over a pair of hedgerows with a narrow lane between them. Kate kicked up to a gallop and aimed straight for an open gateway, crossed the lane, and cleared a single hedgerow, Misty surging powerfully. Scanning to her left, Kate saw a racer tumble through the brambles, but several participants were over and galloping for the next hurtle. Three jumps to go! 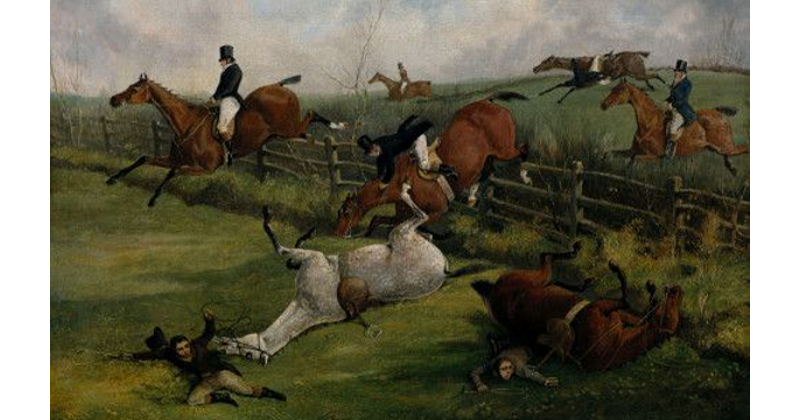 A country steeplechase with several riders taking a tumble, circa 1840. Kate’s chosen route stayed close to the edge of the field, and she needed to traverse a stream with a hedge beside it. She urged Misty to the spot they jumped over yesterday… then jerked upright and reined back. Oh, no! The stream at this corner of the field had swollen from the overnight rains and spilled its bank. Misty splashed bravely into the water, ploughing towards the obstacle without direction from her mistress. Kate, admittedly unprepared and reacting poorly, reduced to a passenger, watched with dread as her hunter stumbled into the stream, then recovered and leapt through the hedge with a jarring thump. Kate pitched forward, briefly grasping her horses neck, then whipped back as a startled Misty kicked and reared. All was not lost. Kate suspected her lead had vanished, but not by much and, without urging, Misty raced for the next hurtle. Ah! Brilliant animal! Regaining control of herself and the reins, Kate crossed a low stone wall and aimed for her favoured space to clear the remaining obstacle; a combination of brambles with scattered stones and a ditch. Spectators cheered as the racers entered the last field and galloped for Saint George’s Church. Kate saw her maid, Isabel, standing on a hillock and waving, her step-mother’s maid, Miss Lydia Pierce, beside her, and several young men around them. The angle of the pack and Kate’s line quickly closed together. She eased into fourth place and let Misty loose to pursue Hugh on his bay stallion. Directly in front of Hugh rode the large man on his chestnut stallion, and in the lead a sinewy farmhand on a tall black mare. Kate judged all the mounts as strong, with little or no chance of her overtaking them. She glanced back and counted two participants close behind, but felt confident in staying ahead of them. They entered the village to loud cheers and barking dogs. In some regards, Kate considered this the most frightening and dangerous portion of the race, and she inwardly cringed as red sandstone walls ran like a blur in her periphery and people waved and whooped. 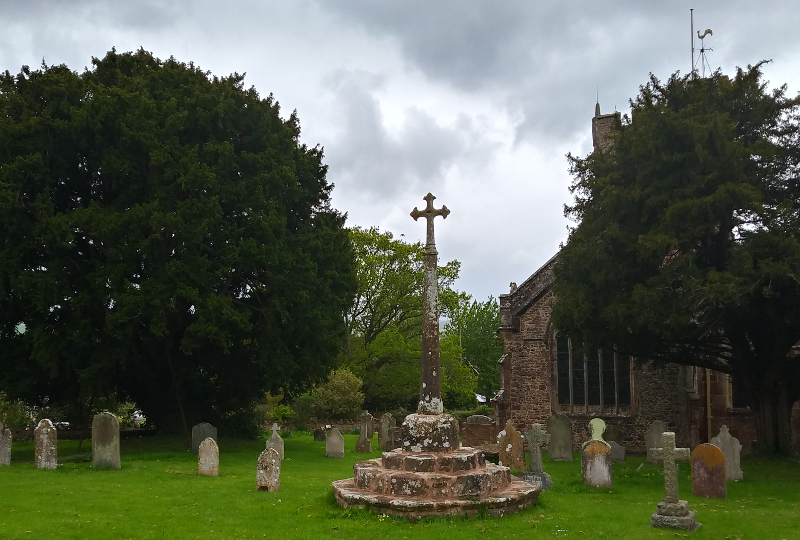 She started reining back while passing the church, then dropped to a walk and circled beyond the other participants who had halted between the churchyard wall and a cottage. A moment later a pack of winded and lathered mounts came pounding up the lane, followed by the mass of spectators. Children jumped and cheered, men yelled and shook hands. Kate, feeling thrilled but also disappointed, turned Misty away from the crowd and walked her to the small gate at the north corner of the churchyard. “We need some quiet, don’t we, girl.” The mare skipped a few times, and tossed her head. “Easy now. The race is over. You ran perfectly.” In the cool leafy shade by the gate, Kate dismounted, hugged Misty around the neck, then loosened her girth and slid the stirrups up the leathers. “We should hurry.” Kate heard the rollicking crowd moving from the lane to the south end of the churchyard. She quickly lifted her veil and draped it over her hat, flicked the worst of the dirt clods off her jacket, then led Misty along the path to the church. “You, as well, Mr. Wansbrough. How have you been?” Kate had spent some time with Hugh during a visit to Bath a few months previously and discussions turned somewhat earnest, with the young gentleman stating his love for her in an awkward confession. She liked Hugh, but held some misgivings about his behaviour. “Happy Birthday!” Kate wanted to keep things light and friendly, and knew he had just reached twenty years of age. “Thank you.” He removed his top hat and bowed, then froze upon noticing the mud. “Hmm…” Hugh made a comical cross-eyed frown, then produced a handkerchief and smeared the grime from his nose and cheeks. “Am I improved?” He grinned. “Here.” Kate took his cloth and daubed a few particularly grubby spots. Hugh leaned close and lowered his face. When Kate looked from the smears to his eyes, she noticed him staring intently into her eyes. “That will do.” She turned away. This is entirely too intimate. “I should find my parents.” Kate started along the path again. Kate felt vindicated by his slang enthusiasm. She peered down briefly at her frilly white bodice, long tight-waisted green velvet jacket, buckskin riding trousers showing at her knees, and tall shiny black boots. Kate loved this outfit; even the mud speckling looked good. Her step-mother, Jane, had railed against any girl appearing in such attire, except perhaps for a fancy-dress ball, which made wearing it all the more satisfying. The issue of Kate riding astride instead of side-saddle, which Jane had only learned of that morning, briefly reduced the lady to a quivering incoherent lunatic. “Thank you,” Kate said, giving Hugh a bright smile. “You look splendid.” And she genuinely meant her words, appreciating his black riding suit, tall lean frame, wavy dark brown hair, and light blue eyes. “Thank you, my lady.” Hugh theatrically dusted a sleeve and adjusted his cravat. “Shall my groom tend to your hunter?” he asked as they neared the crowd forming beside the church. “Yes, just there.” Hugh waved to a boy standing by the wooden water troughs set out for the horses behind the church. A landau with the roof folded down. “Who is that with your father?” Hugh asked, as though reading Kate’s mind. “Urm…” Kate knew the answer, but feigned nonchalance. Earl Grosvenor had made clear his age to Kate the month previously when they wandered one afternoon in Hyde Park, and his hope of marrying by the age of twenty-five. “Twenty-two, I believe.” She grew warm remembering how she had given Hugh a kiss while in Bath, similar to one she placed on Earl Grosvenor’s cheek while in London. They passed through the gate and Kate made eye contact with her step-mother. A young gentleman, circa 1850. “Lord Grosvenor takes quite an interest in the merchant class, my lady,” Hugh said. Kate’s stomach tightened at Hugh’s reference to the day they spent together, not wanting Earl Grosvenor to know, or imagine that she had some entanglement with Hugh. Earl Grosvenor’s face showed no emotion as he stared directly at Kate. “Jack?” Earl Grosvenor interrupted with a doubtful expression and tone. “Indeed.” Kate replied firmly with a raised chin. Why not? “Hmm… perhaps,” Kate allowed reluctantly. “Nothing for me, thank you,” Earl Grosvenor replied softly. “No, this was our debut… and my first official steeplechase.” Let’s not mention last year. “My father purchased Misty last summer. I rode her on a hunt – side-saddle. I usually ride side-saddle,” Kate added quickly, suddenly feeling apprehensive about an unladylike representation. “You don’t… do you believe my costume is appropriate? That riding astride – a girl riding astride – is acceptable?” Why do I care about his opinion so much? He’s starting to blush… I’m getting hot, too. “You’ve never mentioned anything about horses before,” Kate said, sensing a tingling inside. I’m sure there is… but can’t it wait a few years? “Here we are!” Hugh strode up to them with a tankard in each hand, extending one to Kate. Cheers from everyone tore Kate from her thoughts. Above and beyond the crowd, standing on the steps around the ancient stone broken cross, Mr. Sweeting presented a purse to an elderly gentleman. The gentleman fished one sovereign from the purse and made a great show of bestowing it to the sinewy farmhand who had ridden the tall black mare. Applause followed, then the crowd started shifting out of the churchyard, heading to the coursing events in a field south of the village. The Quarrel or Out of Tune by G.J. 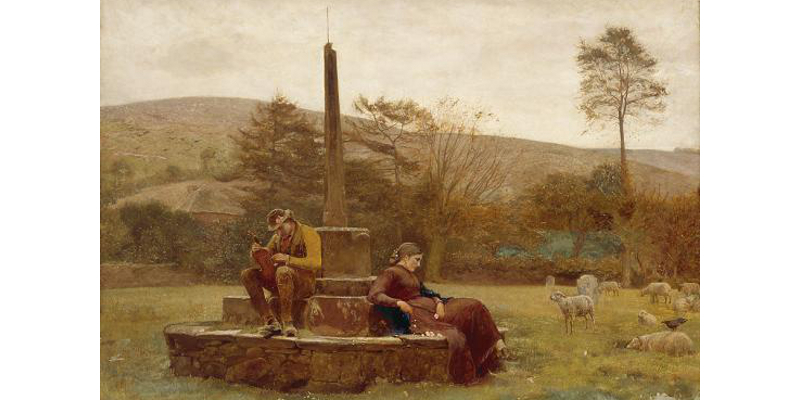 Pinwell, circa 1860, depicts the ancient cross and churchyard in Bicknoller, the Quantock Hills in the background. “Will you wager on the hounds, my lord?” Hugh asked. “I’ll speak with Lord Beaufort forthwith. My lord.” Hugh bowed to Earl Grosvenor. “My lady.” He bowed to Kate. Kate performed a small curtsey then watched Hugh plough through the crowd towards her parents. “A determined young man,” Earl Grosvenor observed under his breath. “Yes,” Kate agreed quietly. And bold… amusing… tall… he’ll be a wealthy merchant one day. “Well… my carriage is outside of the village. I’ve quite a way to go before reaching your house. I look forward to seeing you later today, Lady Kate.” He bowed. “Lord Grosvenor.” Kate curtsied, and spur-raked her right boot. Again?! Double drat. Kate watched Earl Grosvenor walk from the churchyard and along the lane. He’s a kind man, I think. Polite… handsome… he’ll be the Marquess of Westminster one day. She rotated back and noted Hugh in conversation with her parents. I’ll avoid them. Slip through the shade and collect Misty. Kate made it to the water troughs without talking to anyone, thanked Hugh’s groom for his care, then led her horse around the church and exited the main gate. Once out on the lane she briefly waved to her parents, then pressed on without looking back or waiting for a call. She headed south, aware of a mounting block at the inn she could use to facilitate getting into the saddle without jumping. Kate replayed the morning in her head, weighing everything the young men had said, how they acted, their facial expressions during the conversations, causing her some worry. Two cheerful little girls, wearing plain clothes festooned with gaily coloured ribbons, stopped Kate as she neared the inn. “And the prettiest,” said the other. The girls stretched up to pat Misty’s nose. Misty took a large bite out of Kate’s bouquet. The girls giggled and Kate laughed. Kate watched the girls skip away and disappear upon passing the corner of the inn. She let Misty eat the flowers, tightened her girth, slid the stirrups down, stepped onto the mounting block, then eased into the saddle. As Kate rode to the south end of the village she smiled brightly to everyone she passed, feeling very good about herself. St. George Church and yard, Bicknoller, as it is today. A new cross was added to the top of the medieval monument in the early 1900s. Kate would have stood in the shade of the ancient yew on the left. The horses found water and rest at the back of the church on the right. The crowd gathered around the cross for the speeches and presentation.